Although Borobudur may be just a small village, it has become a leading tourism destination, since it is home to one of Indonesia's most famous and largest Buddhist temples. The Borobudur Temple draws visitors from all over Java and beyond, and is quite spectacular, comprising well-preserved terraces, stairways, gateways and various stone reliefs. Built during the 9th century, the Borobudur Temple is actually one of three temples, with the Mendut and Pawon temples being close by and positioned in a perfect straight line. Tourist information is readily available alongside the Borobudur Temple, being situated at the entrance the temple, as well as within local hotels at the neighbouring town of Mageang, which is around 25 minutes away and to the north. Tourists do of course come to Borobudur for one thing only - to see its temple. This is understandably the main attraction here and rather overshadows everything else. However, if you visit the Borobudur Temple and still have time to spare, then you may well like to take a trip to the Mendut Temple (Candi Mendut) and the Pawon Temple (Candi Pawon), which really are easy to find and reach. If you have had your fill of ancient Indonesian archaeology for one day, then why not head to the Elo River (Sungai Elo) and try your hand at tackling its rapids, by joining one of the regular white-water rafting expeditions. More information about Borobudur Tourist Attractions. Located within the actual monument grounds and next to the exit, the Karmawibhangga Archaeological Museum is cram-packed with information about the story behind the Borobudur Temple itself. Archaeological highlights here include some ancient carvings, a number of Buddha statues and sculptures, and a series of photographs, showing the temple's relatively recent restoration project. Entrance to the Karmawibhangga Archaeological Museum is actually included within the overall admission price of the temple, meaning that there is no good reason to overlook this particular attraction. More information about Borobudur Museums. Located almost in the very heart of Java, Borobudur is incredibly well placed for day trips and many tourists choose to visit the temple, en route to nearby destinations. Three cities in particular stand out as appealing excursions - those of Semarang, Solo and Yogyakarta, each of which have something different to offer. If your exploration of the Borobudur Temple has left you craving more in the way of ancient Javanese temples, then head straight to the Dieng Plateau or Prambanan complex. 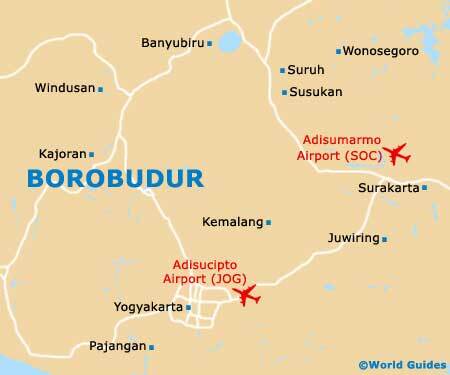 More information about Borobudur Attractions Nearby.